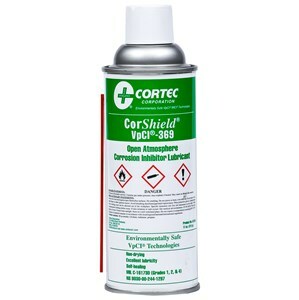 Cortec CorShield Wet Film Corrosion Inhibitor and Lubricant VpCI-369 is a non-drying aerosol spray with excellent lubricity. Self-healing. Conforms to MIL C-16173D (Grades 1, 2 & 4). NSN 8030-00-244-1297 11 oz. aerosol spray.